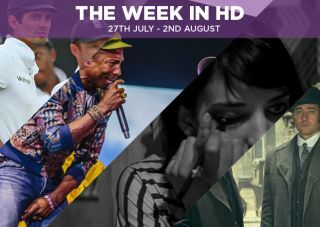 The Week in HD - A Girl Walks Home Alone At Night, Ripper Street, The Ashes, and more | What Hi-Fi? If your love of vampires needs reinvigorating, this brooding, one-of-a-kind movie from Iran could be just the thing to do the job. So says our review of the Iranian vampire film, shot entirely in black and white with little dialogue, giving it a dreamy, surrealistic and noir atmosphere that we haven't seen since F. W. Murnau's Nosferatu in 1922. This fresh new spin on the tired genre - complete with unfamiliar setting and culture, a tender and sweet relationship - is a must-watch for any horror film fan. A beautifully shot and poignant period film set during the outbreak of the Second World War. In Nazi-occupied France, Lucille Angelier (Michelle Williams) lives with her dominating mother, and awaits news of her husband (played by Sam Riley) - who is now a prisoner of war. When German soldiers arrive in town and start living with the villages, Lucilles struggles not to fall in love with the Bruno (Matthias Schoenaerts), the German officer living with them. The shifting loyalties between the villagers and officers, the love triangle and the looming war all have their consequences in this seemingly romantic tragedy. Spaghetti Westerns v Mixologists. Three film fans take on a team of cocktail enthusiasts in this fiendishly difficult quiz where all you have to do is find the connections between seemingly random things. It's harder than it sounds. Church in Ruins. Ani and Paul begin to find clues about the identity of the killer, while Ray and Frank hash things out after it's revealed that Ray murdered the wrong person in revenge for his wife. Horror hits have become few and far between, but 2013's The Conjuring served up a tense plot, creepy scares, a spooky atmosphere and decent characters. What made it even more spine-tingling was that it was based on real events. The prequel follow-up doesn't have the same impact, but it traces the origins of the haunted Annabelle doll, its evil influence over a family with a newborn baby, and a demonic cult that is determined to raise a horned demon. Also, creepy dolls are just plain creepy. Missed the Isle of Wight Festival this year? No worries, Sky Arts cherry picks the best performances from Seaclose Park. Acts include Blur, Fleetwood Mac, The Prodigy, First Aid Kit, Groove Armada, Pharrell Williams, and plenty more. England's spectacular batting collapse at Lord's has tied the series at one-each and left Alastair Cook with a bit of a headache about his batting selection. The England camp will hope that the pitch at Edgbaston is more responsive than the slow, flat offering at the home of cricket - otherwise they may find themselves facing another defeat. Chapter Fifteen. Jane and Rafael revisit the idea of moving in together when they receive news about their baby's health. The Great Red Dragon. Hannibal may have been cancelled (and some might say the over-indulgent approach of style over plot means its death knell sounded just at the right time), but we thankfully get to see the third series play out the story of the Red Dragon. Fast-forward three years from last week's episode, and we're introduced to Francis Dolarhyde - better known as The Tooth Fairy (and played by The Hobbit's Richard Armitage). A serial killer obsessed with William Blake's drawings, he poses a fresh new challenge to Will and the FBI. So much so that they may need to go to a like-minded individual for help. Again. A ridiculous premise sees Will Ferrell line up against John C Reilly as two 40-year-old men who still live at home and are forced to share a room when their single parents get married. It's a gleefully bonkers comedy in which Reilly's Dale Doback steals the show with some incredibly immature behaviour. Former Manchester United striker Andy Cole talks about his time playing football for some of the biggest clubs in England. Includes interviews with Sir Alex Ferguson, Kevin Keegan, Ryan Giggs, Sol Campbell and Cole's former mucker, Dwight Yorke. Perhaps they'll ask Andy what he was thinking when he chanced his arm at being a solo music artist? The sequel to a film that most people this side of the pond don't know about. First Day at Camp sees nearly all the original cast of Wet Hot American Summer return in a Netflix original series that's set up before the first film, despite the performers being 14 years older. Hmmm. The comedy panel show about telling lies and truths returns for a ninth series, with Rob Brydon, David Mitchell and Lee Mack back as the regulars. Tonight's guests are Jon Richardson, Danny Dyer, Joe Lycett and Moira Stuart. Cancellation, renewal, and now back on primetime telly. BBC's Ripper Street has had an eventful history, with the show now finding its new home on Amazon Prime Instant Video. For non-users of streaming services, the third series is finally going to air on BBC. If you've managed to avoid spoilers, we salute you. The show plunges us back into the grimy, foggy, crime-filled streets of Whitechapel in Victorian London, four years after the disastrous events of series two. We're reunited with Detectives Reid, Drake and Jackson (played respectively by Matthew Macfadyen, Jerome Flynn and Adam Rothenberg) - but the former friends are at odds with each other, to put it mildy. A train wreck, stolen Bearer Bonds, Long Susan's new business and past traumas will force them to work together again. Relentlessly poking fun at Hollywood and action films in general, 2008's Tropic Thunder is far funnier than anyone thought it would be. Robert Downey Jr makes a career return as an Oscar-winning actor who takes method a bit too far, Jack Black as a substances-addicted fat comic actor, and Ben Stiller as the action hero caught in a sequel-churning franchise. As they shoot a Vietnam War film in the middle of an actual jungle, the prima donna actors, set antics, misbehaving special effects and inexperienced director (Steve Coogan) all make for a chaotic, satirical and hilarious couple of hours. And you'll never look at Tom Cruise in the same way again. There's absolutely no shame in staying in on a Saturday night to crank up your hi-fi/AV system and spend a couple of hours headbanging to the highlights from this year's Download Festival. Acts taking the stage at Donington Park include: Muse, Judas Priest, Slash, Marilyn Manson, Motley Crue, Kiss, Faith No More, Billy Idol, Thunder and many many more. It's the traditional curtain-raiser for the new football season that sees last year's league winners (Chelsea) go up against the FA Cup holders (Arsenal). Both teams have barely reinforced their squads this summer, but Arsene Wenger did a nifty piece of business in the transfer window, with Chelsea's Petr Cech becoming Arsenal's Petr Cech. Arsenal have had problems against a Chelsea team led by Jose Mourinho; now would be a good time to put one over on them. The Blitzkrieg Button. Fugitive Howard Stark makes a surprise appearance, endangering himself and Carter's undercover investigation. He wants Carter to steal the dangerous title device from the S.S.R. 's labs before it falls into the wrong hands - but does he have an ulterior motive? Meanwhile, Chief Dooley is making his own enquiries, meeting with an imprisoned Nazi colonel to find answers about the doomed Battle of Finow. The Secret Adversary, Part Two. The Beresfords continue their search for the missing Jane Finn, but things get complicated as the amateur sleuths get further involved in the dangerous world of espionage, secrecy and war. They must also figure out Brown's identity without blowing their cover. MORE: Watch the full Spectre trailer. Again.